Top 10 Facts About Pufferfish! | Always Learning! If you think the octopus is the only animal in the ocean that can transform, think again. There are other amazingly deceptive sea creatures. At first glance, they are slow-moving, gentle, beautiful. But beware. When threatened, these fishes can transform themselves into weapons and turn into one of the deadliest creatures in the world. What are we talking about? Pufferfish, of course. Let’s learn more about them below. Fact 1: There are more than 100 species of pufferfish. Pufferfish are all the fish that are in the family Tetraodontidae. That’s about 120 species in 19 different genera. They can be found in tropical waters all over the world, in both saltwater habitats, such as the Pacific Ocean and the Red Sea, and freshwater habitats such as the Mekong River, the Amazon River and estuaries. Pufferfish are characterized by long, tapered bodies, rounded heads, prominent lips and large stomachs. They do not have scales but some of them have spines. They are slow swimmers but can achieve a burst of speed when needed. They can also easily change direction when swimming and even swim backwards. Pufferfish are known by other names, such as puffers, balloonfish, blowfish, globefish and toadfish. They are not to be confused with the porcupinefish, which belong to a different family. Fact 2: They can grow up to nearly four feet long. The largest pufferfish is the stellate pufferfish, which can grow up to 47 inches long or almost four feet, even longer than some sharks or baby crocodiles. It can be found around Africa and Japan. The ferocious pufferfish from around Australia is also large, measuring up to 36 inches, while the giant freshwater puffer from the Congo River can reach 26 inches long. On the other end, the smallest pufferfish is less than an inch long – the dwarf pufferfish of Southwest India. Aside from their size, dwarf pufferfish have a notable ability – they can choose whether to become male or female. At least, the oldest of the lot can. Once a juvenile dwarf pufferfish chooses to be male, the rest are forced to become female. However, in some cases, two develop at the same time and choose to be male at the same time, and so one of them ends up becoming the dominant male. Fact 3: When threatened, they can puff up to make themselves up to three times larger. Pufferfish may vary in size and in appearance, but there is one thing they all share, which is what gives them their name – the ability to puff up. You see, because pufferfish are brightly colored and move slowly, they are more likely to get eaten by larger fish. To prevent this fate, pufferfish have come up with an amazing strategy. When they are threatened, they can take in so much air inside their stomachs that they bloat and turn into large, perfect balls. This makes them look harder to eat. Also, some pufferfish have spines and when they puff up, these spines stick out like needles. Now, who would want to eat something covered in all those pointed things? Pufferfish are not the only ones who make themselves look larger when threatened. Some lizards, like the frilled lizard or the thorny dragon, show their frills. Some snakes such as cobras lift their bodies off the ground and some birds, like snowy owls, spread out their feathers. Fact 4: Pufferfish are among the most poisonous animals on earth. What makes the pufferfish deadly, though, isn’t their appearance. Most pufferfish, when they inflate, release a dangerous chemical on their skin, which is known as tetrodotoxin or TTX, a chemical 100 times more toxic than cyanide. Tetrodotoxin is a neurotoxin, which means it damages the nervous system, particularly blocking the communication channels between the brain and the body. Without messages from the brain, the skin grows numb, paralysis occurs and the lungs and heart fail, and the animal or person dies within minutes. In humans, the first symptom of TTX poisoning is a numbness of the lips or tongue, followed by a paralysis of the muscles of the face, dizziness, headache, nausea and difficulty walking. The person becomes unable to move, speak or breathe, turning blue, until he or she is completely paralyzed. Death usually occurs within hours without treatment but in one case, it happened after only 17 minutes. Pufferfish do not just contain TTX but one pufferfish can carry enough toxins in its liver to kill 30 human adults. For this reason, pufferfish are considered the second most poisonous creatures in the world, after the poison dart frogs. Fact 5: Pufferfish are like chameleons. Pufferfish share two traits with chameleons. They can change color, turning lighter or darker in response to their environment, and they can move their eyes independently, meaning they can move their right eye in one direction and their left eye in another so that they are looking at two different things at the same time. Cool, right? Pufferfish have excellent eyesight, which allows them to spot predators quickly so that they can either flee or puff up before it’s too late. Fact 6: Pufferfish have four teeth. Photo by Sponchia, PD image. Earlier, we mentioned that pufferfish belong to the family of fish known as Tetraodontidae. This family name comes from two Greek words – tetra meaning ‘four’ and ‘odous’ meaning ‘tooth’. Indeed, all pufferfish have four teeth – two at the top and two at the bottom, both fused to look like one large tooth, making pufferfish seem like they have beaks. Also, like rats and mice, pufferfish have teeth that keep on growing, so to keep the teeth short, they eat shellfish, using their teeth to open the shells. They also feed on coral, algae that grow on rocks and bottom-dwelling worms and fish. Fact 7: Some species of pufferfish build `nests’. The white-spotted pufferfish have a unique habit – the males are known to make `nests’ in the sand, round and more than 6 feet in diameter. More impressive even is that they never reuse a nest but make a new one each time. Their purpose? To attract females, of course. If the female is impressed, she will ‘lay’ her eggs in the nest and the male fertilizes them. Normally, the female simply follows the male near the water’s surface or to some cover where she releases her eggs. After fertilization, the eggs develop hard shells and after hatching, the fry swim off, ready to find food. Masked pufferfish males also make ‘nests’ but for a different purpose. They create a home out of their sperm, where they can hide from predators. Also, the sperm gives their home a foul smell which masks their own scent. Fact 8: Pufferfish can be kept as pets. 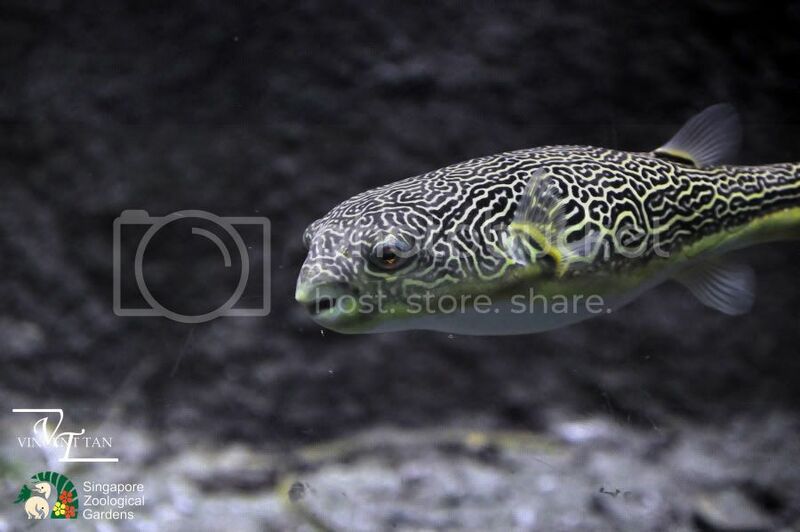 Some pufferfish, such as the spotted green puffer, the bronze puffer, and the pignose puffer, can be kept in home aquariums but mind you, it is not an easy task. 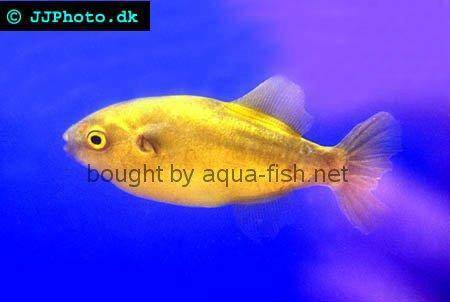 Pufferfish need a lot of water, which means that even for a small puffer, you’ll need a large tank. And you’ll need to change the water often or the pufferfish will get sick. Remember, pufferfish don’t have scales, which means they can get sick easily and they are more sensitive to changes in water quality. Also, pufferfish cannot be housed with other fish because they tend to be aggressive as they mature and because their teeth grow continuously, they need to have shellfish such as snails to eat and coral to chew on in order for them to keep their teeth trimmed. Fact 9: Pufferfish are a delicacy in Japan. Blowfish dish Fugu Japanese poison fish by Tamaki Seto, PD image. In Japan, pufferfish aren’t pets. They are a delicacy. A dish prepared from pufferfish is called fugu and only chefs who have trained for three years or more can prepare it, since they have to remove the poisonous organs of the fish so that the people who eat the dish won’t die of poisoning. In spite of this, many people have still been poisoned and some have even died. Between 1996 and 2006, 44 fugu poisoning incidents were recorded in Japan. Fact 10: Some species of pufferfish are endangered. Photo by ClkerFreeVectorImages, Pd image. Most pufferfish have either thriving populations or are not researched enough to yield population information. However, some species are known to be endangered. The Chinese puffer, for example, which is found in China, Japan and Korea, is Critically Endangered, its population having declined by 99% in the past 40 years. This is mostly due to overfishing for its meat. Canthigaster cyanetron, which is a pufferfish only found around the Easter Island, is also endangered because of the destruction of reefs around the island, while the redline pufferfish from the Cross River in Nigeria and the dwarf pufferfish are both listed as species that are Vulnerable to extinction. 25 Weirdest Animals in the World!. The YouTube video below is a collection of videos about pufferfish. The list of videos featured is underneath. Puffer Fish by National Geographic. A pufferfish protects itself against an otter the way it does best. World’s Weirdest : Poisonous Pufferfish vs. Eel by NatGeoWild. It seems like David vs. Goliath, but this pufferfish breaks out its secret defense against a moray eel… and saves both their lives in the process. Eating Poison Fish by NationalGeographic. The puffer fish is a very expensive dish to eat…but watch out, it can kill you. Puffer Eating Shrimpies by brittany265. A video showing a pet pufferfish scoffing shrimps. Previous articleVampire Squid Facts You Need to Know! OMG!!!!! I LOVE THIS ARTICLE! I used this for a report at school. I know this so cool. well y’all should add more facts about more.